We Can(ada) Read: Serena & Sasha from The Writing Duo discussing Eve Silver! 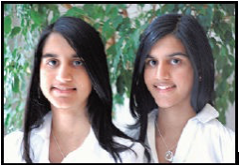 Sarena and Sasha Nanua are twin sisters living in Ontario, Canada. They love reading books in their spare time and enjoy science fiction and fantasy novels. They have been writing books since they were nine years old and are currently studying English and Professional Writing at the University of Toronto. The Gemstone is their first novel. Visit us at sarenasashabooks.com! Hi everyone! We’re both very excited to be here discussing an awesome author who you might know for her kickbutt YA series: The Game Trilogy (RUSH, PUSH, and CRASH!). The first time I picked up an Eve Silver book, it was from the library. It was 2013, and I had just recently heard about a new buzzing YA series called The Game Trilogy. The book centres on a sort of virtual reality “game” with aliens, but the lines of the game and reality begin to blur … and Jackson, one of the main characters in this “game” is also hiding his own secrets. Since this blog feature focuses on awesome Canadian YA authors, we thought we’d talk a bit more about our experience having met Eve Silver. Last October, we attended a conference in Toronto (the Toronto Young Writers Conference), where Eve was hosting a workshop on world-building. It was pretty surreal to have seen her in real life—at that time, I’d finished her whole series and definitely loved it. (I even won a signed book from her … but I brought my own copy to get signed, so I had an extra for a giveaway. Score!) She is truly kind and compassionate, and does a lot of work to help youth with their writing. It was so surreal when we got to tell her about our books, and she gave awesome advice. (We later found out that she bought the ebook for The Gemstone, which was even COOLER!). Eve is definitely a local talent to look out for, and if you want to stray from sci-fi, she has several other historical and paranormal novels. Eve Silver lives with her gamer husband and sons, sometimes in Canada, but often in worlds she dreams up. She loves kayaking and sunshine, dogs and desserts, and books, lots and lots of books. Eve’s teen trilogy The Game—Rush, Push, and Crash—is available now. Eve also writes books for adults.